This Colombian zoo in Cali is always crowded with visitors. It is spread over twenty-five acres and is known for its rich biodiversity. There are more than one-thousand animals from around two-hundred species. Some of these are the baboon, white Bengal tiger, lion, jaguar, brown bear, black bear, white tailed deer, howler monkey, zebra and giant otter. Endemic Colombian reptile - red fer de lance - is also in the zoo. 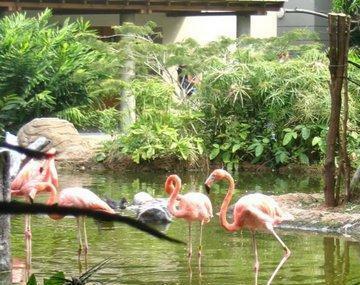 Birds like an ostrich, black swan, emu, brown pelican and American flamingo can also be seen here. Authorities are aiming to provide the natural environment and proper care to all the animals. They also arrange different educational programs and camps for kids. Explore Cali Zoo and other prime spots of the city using Cali trip planner. Draft the best Cali vacation packages using ideal templates offered by TripHobo. Also explore how to reach Cali on the go! Highly recommended to visit ZOO!! What i really liked about this zoo is that its very organized with varieties of options to explore the animals from birds, reptiles, mammals, to species such butterflies and insects. It's very clean, and easy to explore as everything well-written on the maps! Best time is in the morning when there are less crowd! In addition, the Zoo also has museum section that explains about the environmental topics like forest coverage in Colombia, rate of deforestation as well as section that touches sustainable development goals (SDGSs). + fair prices (entrance 22000 per Person, over 13 years) + well organized zoo + A lot of different Reptiles and exotic animals + Different food possibilities (fair value for money) + Good location of the zoo All in all I can more than recommend to visit this Zoo in Cali! It is definitely worth it!! A wild selection of birds, fishes, reptiles, lions, tigers, zebras, ostriches, zebra, turtles, kangaroo, monkey's plus many many more. Very family friendly. Good choice of ice cream, cafes and restaurants in the zoo. Very affordable prices for entry 20,900OPesos for 1 adult. Staff are polite and friendly. Spent a good 3 hours. Great expression of Colombia's plants and animals. The setup was first class and there are plenty of educational experiences to be had. I was impressed.